We caught up with Stephanie Arsorska, the organiser of an intriguing and innovative event format – the online spoken word gathering Virtual Spoken Mic Night, to find out more about what could be an emerging format of literature-event-meets-online-writers’-community. EB: So Stephanie, what gave you the idea to start an online open mic event for poets? Stephanie: I started the online open mic after several months of feeling frustrated at not being able to get to live events. I have two young children and I live in a small town making events hard to access because of my location and childcare issues but I was desperate to have a space to meet with others and share work so I took a gamble and set up the Virtual Open Mic in the hope that there might be other people out there in similar circumstances. The first night was pretty scary, I had no idea if anyone would come, but I was delighted when people turned up and joined in and it I haven’t looked back since. EB: How many events have you held so far and what have they been like? Stephanie: The night has been running for a year now. We meet once a month on last Wednesday of every month. Sometimes we have a theme, like this month with our Halloween special and other times we leave it open but it’s always very relaxed. Participation is the most important factor so themes are not strict, my priority is to provide a space for people to share their work, whatever that may be. EB: Where in the world are you based – and who is the remotest participant or viewer you’ve ever had? Stephanie: I live in Kirriemuir, a small town on the east coast of Scotland. We have people from all over the UK participate, our most unusual has been one of our regulars who was so determined not to miss the night when she went to visit her parents in Poland that she broadcast from her mum and dad’s toilet! EB: How can viewers and performers get involved in the Virtual Open Mic? Stephanie: The night is free and open to anyone but places are limited so please do get in touch to book if you want to take part or if you want to ask any questions (stephaniearsoska@googlemail.com). Each month we have a special guest reader and then each participant gets a five minute slot. We meet in google hangout so you do need a webcam and a google account. I open the room and invite people in at about 9pm, I then start the broadcast at 9:30pm. Once everyone has performed/read, we stop the broadcast and have an informal chat about the work or just about writing in general. It’s all very relaxed and good fun and not at all scary, most of us have our jammies on the bottom half and you can of course BYOB! Are you interested in getting involved in some online spoken word? 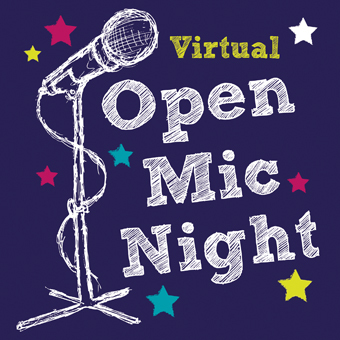 You can read some testimonials here about the Virtual Open Mic. For those who want to watch you can catch the broadcast on YouTube or on google +.